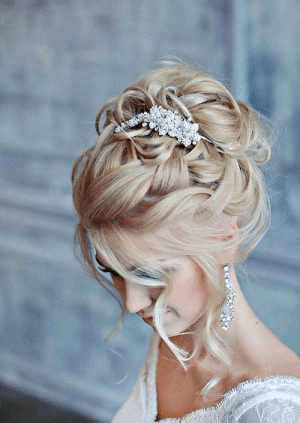 Our bridal hair style specialists and make-up artists in Manchester NH will make every effort to create a memorable and relaxing experience for you and your bridal party. We offer complimentary consultations, and we will work with you to achieve that special look for your big day. We offer add-on services such as facials, permanent and semi-permanent eyelashes, as well as traditional and airbrush make-up. Customize your own package by choosing from our full range of beauty salon services. Offering in-salon services only, we look forward to working with you and making your wedding day memorable. Updos are great for other special occasions, like the prom, graduation, gala, bachelorette parties, etc. If you want to look your very best at an upcoming event, then we can help you. Our team of professionals are devoted to make you look great and feel wonderful. Take a look through our gallery for hairstyling ideas and then contact us today to set up an appointment for a consultation. Please note, we cannot provide a quote over the phone for bridal services.